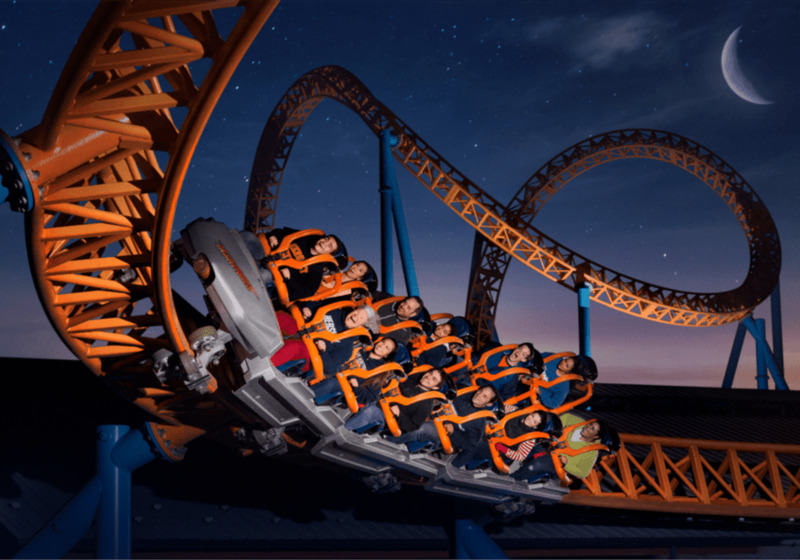 Hershey, Pennsylvania—a town synonymous with chocolate—celebrates Halloween with its annual Hersheypark in the Dark event, which takes place on weekends (Friday-Sunday) from mid-October through Halloween. It's an especially fun time to visit the Hersheypark theme park. What happens during Hersheypark in the Dark? Located just 13 miles from Harrisburg, Pennsylvania, Chocolate Town, USA is a natural setting for trick or treating, and Hersheypark also throws in spooktacular ride experiences and a chance to view zoo animals by flashlight at night. 2018 dates for Hersheypark in the Dark have not been announced. Stay tuned for special events and activities. Hershey's Trick or Treat Adventure, for kids 12 and under, features three trick-or-treat stations in Hershey's Chocolate World and eight stops in Treatville, located inside Hersheypark near FEARenheit. There is also a treat station in ZooAmerica, located adjacent to Hersheypark. Dark Rides at Hersheypark is a once-a-year opportunity to ride a trio of Hersheypark "roller ghosters"—Wildcat, Lightning Racer and Comet with their track lights turned off—for an extra spooky experience. Creatures of the Night at ZooAmerica offers a chance to observe nocturnal zoo residents such as bats, owls, and various reptiles, and attend the nightly mythbusting 'Truth or Tail' show. Don't forget your flashlight. Pumpkin Glow at Hershey Gardens, an evening event with more than 150 uniquely carved illuminated pumpkins and a variety of whimsical scarecrows, some of which come alive. Kids ages 12 and under are invited to bring a flashlight, come in costume, and trick-or-treat throughout the Gardens. What else is there to do at Hersheypark? Hersheypark has rides and attractions for all ages, including the so-called "Thrilling Thirteen," 13 roller coasters ranging from tame to terrifying that stay open day and into the evening: No matter your children's ages and temperaments, you will surely find a roller coaster or two to put a smile on every face. Cocoa Cruiser - This steel family roller coaster lets little kids experience their very first coaster ride, complete with just enough dips, curves and twists. Comet - This classic wooden coaster is a huge fan favorite. Fahrenheit - Coasters don't get hotter than this "vertical lift inverted loop coaster," which begins by climbing 121 feet and then plummeting in what's essentially a free fall down a 97-degree drop, the second steepest in the United States. Great Bear - On this inverted steel coaster, you ride below the track, not above it. The Great Bear twists and loops, reaching speeds of up to 61 miles per hour. Laff Trakk - Recalling the past funhouses that were in Hersheypark from 1930 to the early 1970s, this funhouse-themed indoor ride is the first spinning, steel glow-coaster in the United States. Lightning Racer - The first wooden duble-track dueling coaster in the United States. Sidewinder - This boomerang-style steel coaster operates both forwards and backwards through three loops, so it takes you upside down six times before returning to its starting point. Skyrush - The tallest and fastest coaster at Hersheypark qualifies as a hypercoaster, delivering an 85-degree drop and plenty of airtime. In a word, it's intense. SooperDooperLooper - This was the first looping roller coaster on the East Coast when it opened in 1977, this ride delights coaster enthusiasts with its inversions and helixes but is tame enough for most grade school kids. Storm Runner - A fan favorite since its debut in 2004, this steel coaster catapults riders from 0 to 72 mph in two seconds flat and then climbs 18 stories high before executing a 135 foot cobra loop, barrel rolls, and flying snake dive. Trailblazer - A fun family coaster that kids can ride when they reach the Kisses height requirement. Wild Mouse - A thin-track coaster where small cars make sharp turns, giving you the feeling that your car is about to fall off the track. Wildcat - Launched in 1996, this classic wooden coaster reaches speeds of up to 45 mph and is a family favorite. The ride was named after Wild Cat, Hersheypark's very first roller coaster, which operated from 1923 to 1945. How can you attend Hersheypark in the Dark? Tickets may be purchased online or in person. Consider where to stay in Hershey.